This Moulins a Vent - Window Peel N Stick design instantly makes you sing "la la la la la." It's just so frivolous and happy! Look at it! You get your twirly flower things, your rainbow mix of colors, and your overall whispiness. 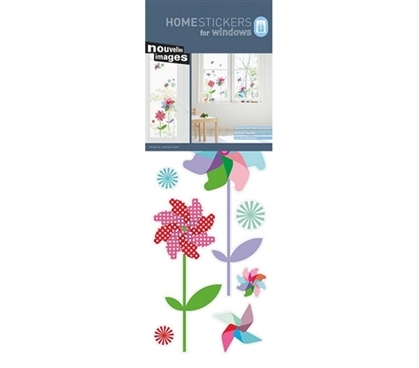 This Moulins a Vent - Window Peel N Stick makes an adorable dorm room decorating idea if you love fun and frivolity. "Moulins a Vent" means "windmill" in french, and windmills are symbols of freedom and majesty (probably, anyway). To decorate your dorm room with such lofty symbols, all you need to do is peel and stick. It's not meant to be hard, like the rest of college. Add this Moulins a Vent - Window Peel N Stick to your college dorm supplies now and enjoy the easy windmill life while you can.